Good Clean Fundraising based in Fredericksburg Va is changing the way Schools, Youth Athletics, Churches and Non Profits raise funds. The product is a liquid laundry detergent which is a staple on most shopping lists already. The laundry detergent fundraiser has been extremely successful with many schools and youth sports organizations raising between $10,000 to $20,000 or more. and Youth Athletics Organizations in a recent opinion poll. The company Good Clean Fundraising based in Fredericksburg VA provides a highly effective and profitable fundraising program for Schools, Youth Groups, Athletic Organizations, Churches, basically anyone that needs a fresh new approach to raising money. They sell a private label liquid laundry detergent that is similar to the big name brands at a fraction of the cost, manufactured by one of the largerdetergent manufacturers in the US. Their fundraisers are different than most because they have a focus on selling Value Priced Necessity items which parents, neighbors and family were ALREADY going to purchase anyway. In contrast to the typical fundraising programs that schools and youth groups put on usually involve selling overpriced candy, cookie dough, etc.. and the parents purchase these things that they really don’t want or need in an effort to support the organization. The worst part is that the company supplying these items is most times making a larger profit than the group doing all the work. The Laundry Detergent Fundraising Program provides a customized order form with the logo of the organization so that it can be printed out and distributed to all fundraiser participants. The profit margin is one of the best aspects of our program as it allows for your group to keep a large percentage of the sale price. Most smaller groups find that raising $3,000 – $5,000 is very realistic by following our program and larger groups have raised in excess of $25,000 in as little as 3 weeks time. 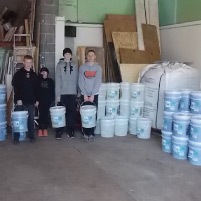 The Laundry Detergent Fundraiser has had enormous success with different groups. Another benefit of using Laundry Detergent fundraising program is that the company Good Clean Fundraising serves as a tremendous resource and guide in helping ensure the fundraiser is a tremendous success. From tips to achieve maximum participation to a Social Media campaign that we will help facilitate high participation. Spring Plant Fundraisers: What Are They, and How Do They Work? Non-Profit Websites: To Pop-up or Not?